On August 14, 1945, it was announced that Japan had surrendered unconditionally to the Allies, effectively ending World War II. Since then, both August 14 and August 15 have been known as “Victory over Japan Day,” or simply “V-J Day.” The term has also been used for September 2, 1945, when Japan’s formal surrender took place aboard the U.S.S. Missouri, anchored in Tokyo Bay. Coming several months after the surrender of Nazi Germany, Japan’s capitulation in the Pacific brought six years of hostilities to a final and highly anticipated close. 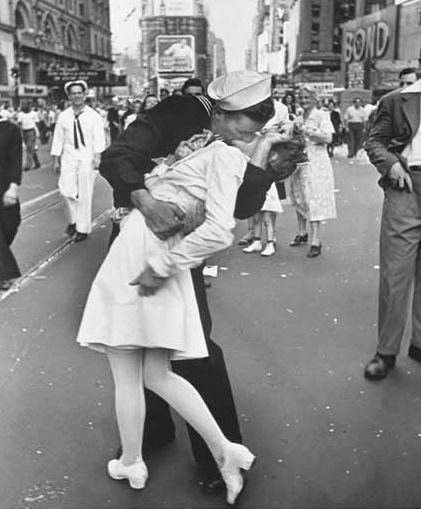 It is one of the famous moments in the history of photography: a sailor kissing a nurse called V-J Day in Times Square. The late Alfred Eisenstaedt, one of the 20th century’s great photojournalists, simply turned around as he was dashing down the street, looking for the right shot to capture the exuberant moment. He saw the embrace – and the picture itself is now history. 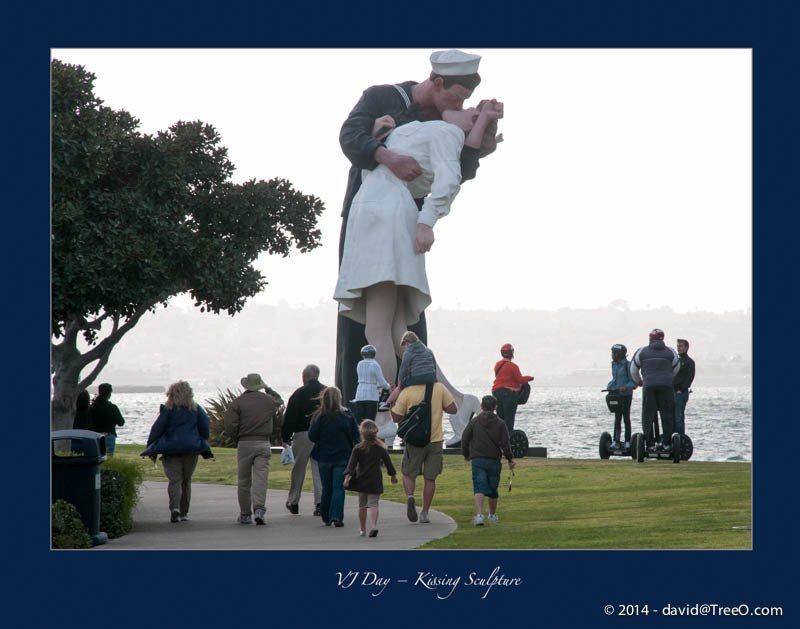 Now, meet the monstrous 25-foot, 6,000-pound sculpture by J. Seward Johnson that evokes this same kiss and carries the tacky title Unconditional Surrender. The bronze statue is near where the U.S.S. Midway Aircraft Carrier is docked. Notice the group of people on Segways. An aluminum copy of the sculpture is in Sarasota, Florida. is this the same sculpture of the sailor kissing the nurse in marina jack in sarasonta fl last week or is it a replica?